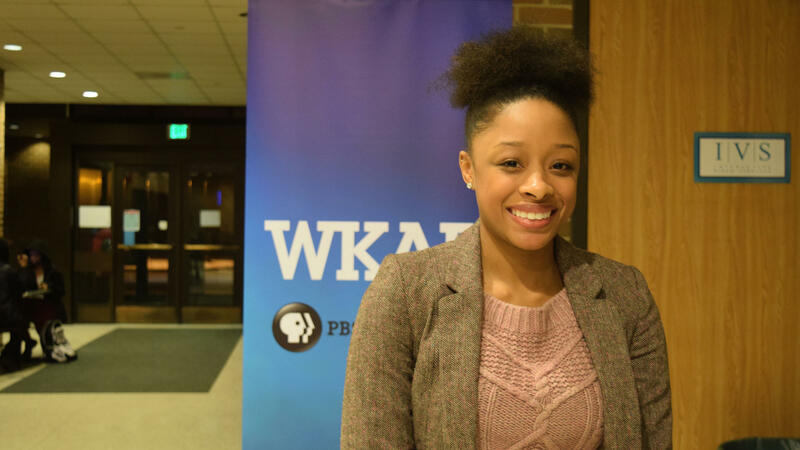 Community members filled the WKAR media auditorium for discussion of 'The Black Panthers.' (l-r) WKAR TV Station Manager Susi Elkins and panelists Kelsi Horn, Pero Dagbovie, Aida Cuadrado. 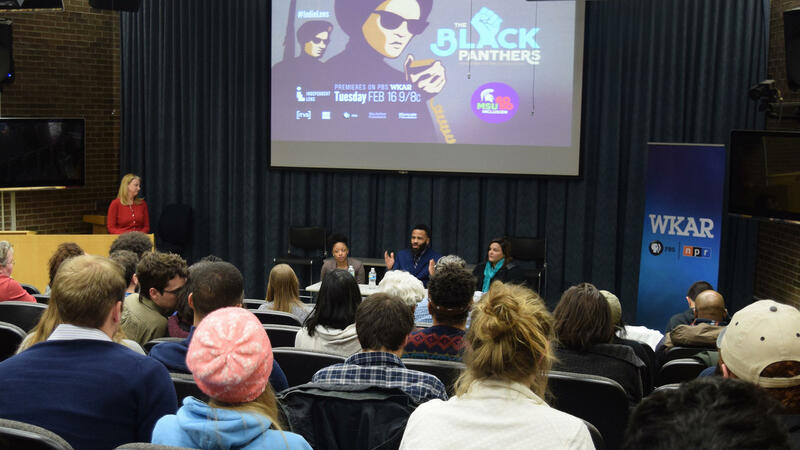 WKAR had a large turnout for its recent Indie Lens Pop-Up Event featuring a screening of The Black Panthers: Vanguard of the Revolution. More than 70 people came out on a cold February evening to view the film and join the conversation. Kelsi Horn is an advertising and public relations junior. As the vice president of Black Student Alliance, she was called to serve as a panelist to give the perspective of a university student. Horn says that she thinks it’s interesting to see the age and race demographic of the audience that attended. Pero Dagbovie is an associate dean and graduate school professor in the Dept. of History at MSU. “I hope that the film sparks some relevant discussions about not only the Black Panther party as we view them today, but also about present day conditions facing African Americans communities throughout the nation and how their experiences are very similar to the experiences of the Black Panther Party members and African Americans who were living during that period from the mid 60s to the mid 70s,” Dagbovie said. Leon Hister is a social relations and policy junior and believes that holding this event in a university setting was beneficial for awareness in the community. Jasmine Key, a social work sophomore, says she would like to see more films like this. She enjoyed the film but believes the setting was too small for a university this size. “I think it’s something that needs to be seen and heard. Not even just the Black Panthers but anything cross-cultural should be something that everyone experiences,” Key said. Analicia Montaner is a Lyman Briggs freshman and attended the event alongside Key. Though this was the best Indie Lens turnout this season, she was disappointed all the seats weren’t filled for the screening. Strategies on getting students involved in collective movements was a topic during discussion. Horn says that it all starts with communication and recognizing other students’ issues and how they compare to yours. Key says we should continue to use social media as a platform to get issues out and recognized. Aida Cuadrado is the director of Action of Greater Lansing. As an activist expert, she hoped to let the audience know that no matter how ordinary, smart, or challenged you are, you have the power to make change. “One of the things I wanted to focus my point on is that we are responsible for our own well-being. We’re responsible for our community, we’re responsible for holding people accountable to make change,” Cuadrado said.